Should I Buy a DC58 or DC59? 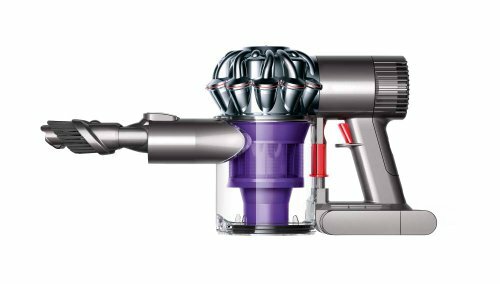 If you are you trying to figure out which new Dyson cordless cleaning machine -- the DC58 or DC59 -- is best for you? Or if you are trying to justify the price gap and/or are simply wanting to clarify some differences between the the two, to gain a better comprehension of what both models can specifically offer -- then you have found the right comparison guide. Which will ultimately help determine which model is best suited to your specific cleaning preferences & which offers you the most 'overall' value respective to its price tag. i) Two Tier Root Cyclone Technology -- this advanced & unique cyclone technology basically allows the DC58 & DC59 to generate incredible centrifugal forces (as opposed to the earlier models e.g. DC34 handheld & DC44 Digital Slim that had just the standard root cyclone technology) which allows for a very high pick-up rate of microscopic dirt & dust particles (as small as 0.5 microns). It also allows them to operate on a balgess mechanism & prevent loss of suction. ii) The Digital Motor V6 -- they both share the updated & refined Digital motor (five generations more advanced from which the predecessors encompassed of the V1 digital motor) which runs on a 350 wattage, which is a far more powerful & efficient than motor than is encompassed within any cordless cleaning machine on the market. An engineering triumph that was achieved with more than 5 years Research & Development (and just under $270 million). iii) The Re-configured Nickel Manganese Cobalt Battery -- this new powered up battery has basically allowed the DC59 to supply an extra 50% more power than that of DC44 in its boost mode (which is 65 AW), so the DC59 can produce a roughly just under 100 AW -- which is huge for a cordless machine (where it is comparison with that of the upright DC24 model with regards to cleaning performance) & hence the DC58 will be somewhat similar, allowing it to have "three times the suction of any other handheld vacuum in use". There are some further distinct similarities too such as the improved run time (due to the trigger mechanism installed) -- where on the Dual power mode system -- they have run time of up to 26 minutes on the standard mode & 6 minutes on the boost mode (with them taking roughly 3 hours to re-charge from 'dead' to 'full power'). Moreover, they have the same bin capacity of 0.35 litres & simplistic bin release system along with the identical set of practical attachments/accessories: the combination tool (enabling powered dusting essentially) & stair tool (for use on upholstery too). They also both come in an Animal version (i.e the DC58 Animal & DC59 Animal), whereas opposed to the Multi-floor version (i.e the DC58 Multi-floor & DC59 Multi-floor) -- you are also equipped with a specialised mini motor turbine which has been engineered for the sole purpose of efficient & effective pet hair pick-up. So if you are debating with DC58 Animal Vs Multi-floor or DC59 Animal Vs Multi-floor, that is the only difference -- there are no improvements with regards to power etc. (they also come in a slightly different skin colour). The actual variation comes in the form of their intended cleaning purposes: the DC58 is a handheld and is hence designed for intricate cleaning jobs such as cars, stair ways & awkward gaps. 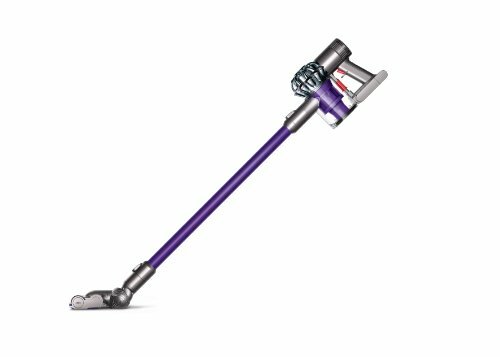 Whereas the DC59 is designed as a stick vacuum, essentially a cordless upright (hence its wand component & carbon filament cleaner head) for use on all floor types. What you should note however, is that the DC59 is actually a 2 in 1 vacuum where it can be manipulated through removing the wand (the 66 cm aluminium tube) & fitting the handle to the crevice tool -- which essentially turns it into the DC58 -- a handheld vacuum cleaner, a fantastic feature. So with the DC59 you are essentially getting: the DC58 which also has the ability for use as an actual upright vacuum cleaner (which can also be used to clean curtains, ceilings etc. due to it being so light & ergonomically weight distributed) as well. Note: the DC59 also comes with a wall mounted charging docking station to allow it to be kept & stored away neatly (it can however be charged separately if needs be). Conclusion -- Should You Buy the DC58 or DC59? So if all you are after is a super powerful handheld vacuum cleaner then go for the DC58. However, if you are after a powerful overall cleaning machine that can offer you a whole range of multi-functionality (including what the DC58 is intended for) then opt for the DC59. However, I understand that you might have some troubles (as did I before the DC44) as to what you might actually use the DC59 for -- but I liken this dilemma very much to the iPad -- where when you don't have one, you aren't really sure what its purpose is, but then once you actually get one it all starts to make sense very quickly & you end up using it more than your actual computer (or in this case normal vacuum) -- because it provides 'convenience'. In sum, they are both great cleaning machines to have - whether it be to either supplement your cleaning or with the DC59 actually somewhat take over (e.g. I personally intend to use mine for upstairs cleaning, in order to save me the hassle of having to lug up & down the stairway my heavy Dyson DC27 vacuum). Both are particularly great options for the elderly and/or those who have mobility issues due to two simple factors really: they are mobile (the benefit of being cordless & battery powered) and they are very light (DC58: 1.3 kg & DC59: 2.3 kg). If you have any questions, comments or concerns regarding either the comparison account: DC58 Vs DC59' or about either of the models specifically (i.e the Dyson DC58 or Dyson DC59) then please do not hesitate to make them in the comments section that you will find just below and we will be sure to get back to you as soon as possible. I have exactly the same question. I called Dyson and they said that apparently the motorised floor tool of the DC44 will connect to the DC58 and work properly. On the other hand the wand of the DC44 is not compatible with the DC58 ( according to Dyson). I don't really believe that. If someone could actually check and confirm that would be great.